PS You don't look short, we aren't that tall. I managed to extract some photos out of my little camera - including one of you on the steps of the Museum of Fine Arts in which you look VERY tall. My mom always cleaned like a madwoman before we left for vacation and it drove the rest of us nuts. Now I understand; I've been known to cry when I walk into a messy house and just ADD to the chaos with all the laundry. I have always been good about cleaning out the fridge beforehand, though, and I love that clean-slate feeling of going to the market when we get home. I feel you on the short thing. My 13 yr old boys are now my height and getting too big a kick out of it! :) Just wait until your guys get there. Fuuuuuuun! I can't wait until I get a chance to meet a fellow blogger! 4 AM? Whoa! And I USED to always leave a clean house, but with a kid and a job it seems impossible these days. Happy chaos, rather. Glad you had fun! And so jealous you met food bloggers. Welcome home! 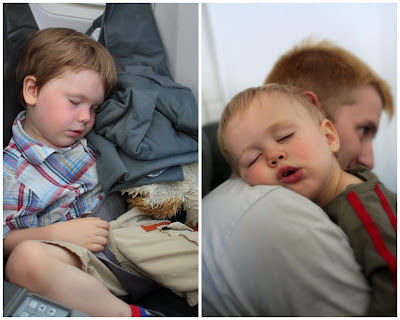 I love it when the kiddos sleep on the plane, I just wish it happened more often! It's always good to be home no matter how good a trip you have had! Enjoy the resettling process. It's our turn next to head to your neck of the woods, leaving beautiful BC at the end of the week for a few days in Montreal and then up to the Saguenay region to visit the monsieur's parents and siblings for a few weeks. This is when my questionable french skills are always put to the test! But looking forward to the blueberries if still in season there! What good sports those lovely boys were! So glad you had a good time... always great to meet virtual friends, innit? Welcome back! take your time - the photos will be worth the wait! Welcome home! 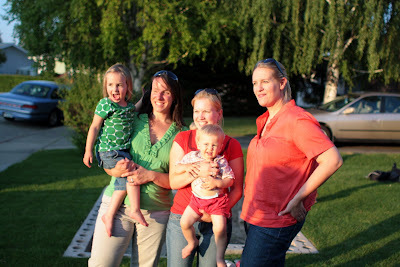 I think it's so cool that you were able to meet other food bloggers.